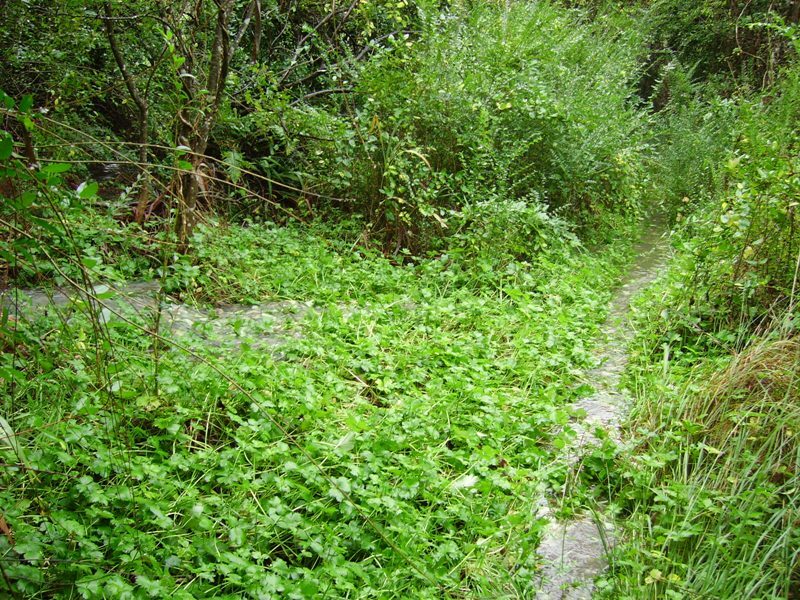 can be easily damaged by big stormwater flows, weeds, pollution and careless use by people. The Creek is a perennial tributary of the Erskine Creek catchment. 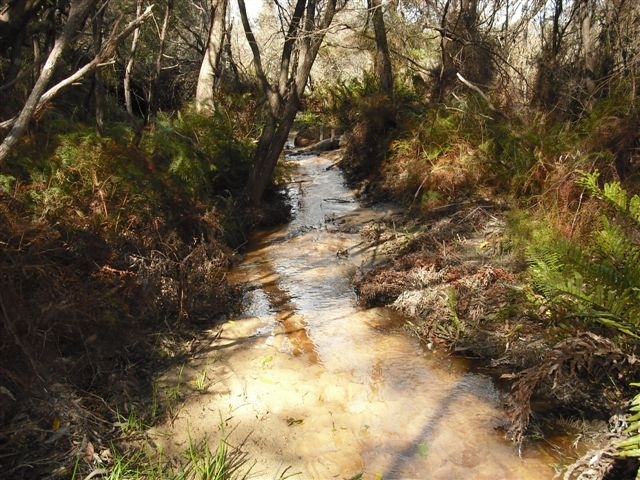 Lawson, Ridge and Cataract Creeks constitute a sub-catchment of Erskine Creek catchment. 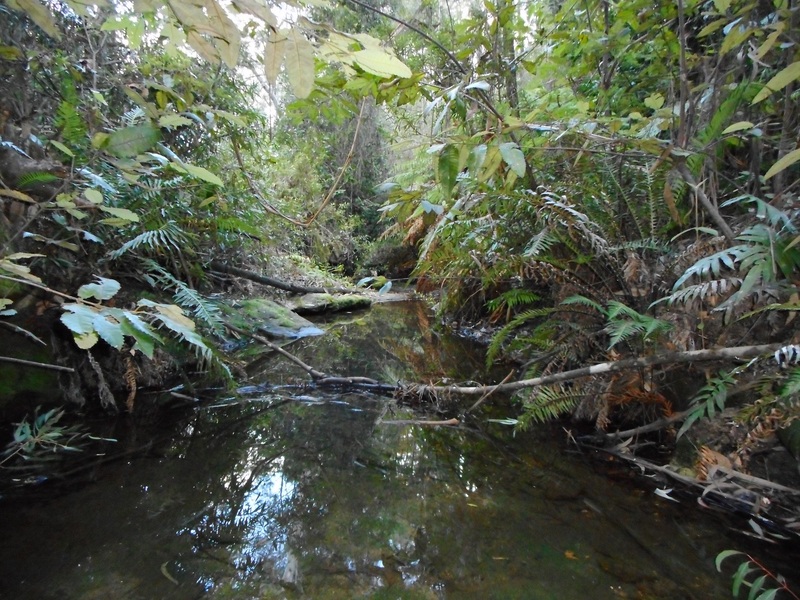 This catchment is a contributor to the extensive Hawkesbury-Nepean River system. The Creek rises south of Lawson shopping centre and the GWH, via a series of minor tributary streams and drain lines that flow into a probably quite altered swamp/lagoon complex. Originally there were many fine swamps in this area but they are now largely degraded or non-existent, although remnant peaty soils still contribute to surface seepage into the main stream. 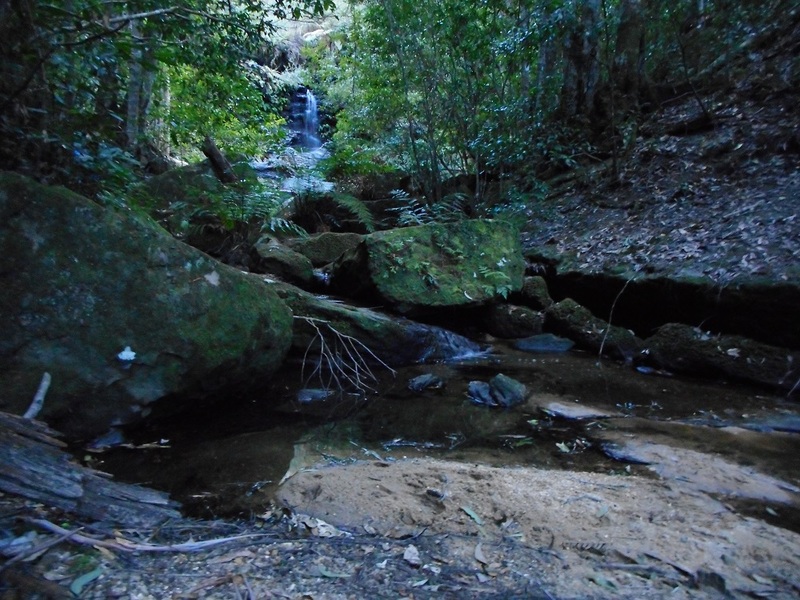 Lawson Swamp stores and feeds a constant supply of water via Lawson Creek to two spectacular and popular downstream waterfalls, Adelina and Junction Falls. At Junction Falls the tributary Ridge Creek discharges into Lawson Creek. A little further south Cataract Creek flows into Lawson Creek. Finally, two kilometres downstream, Lawson Creek terminates, discharging into Bedford Creek, which flows into Glen Erskine Creek to form Erskine Creek, which discharges into the Hawkesbury-Nepean River system. Lawson Creek is in a broadly healthy condition, but the upper reaches are permanently stressed by regular adverse urban impacts such as weed growth, and these adverse impacts are often compounded in severity by specific degradation events. Such an event occurred in 2009-10, when a combination of heavy rains and massive stormwater flows, urban construction work, vegetation clearing and a collapsed track led to massive siltation of the Creek, upstream of Adelina Falls. 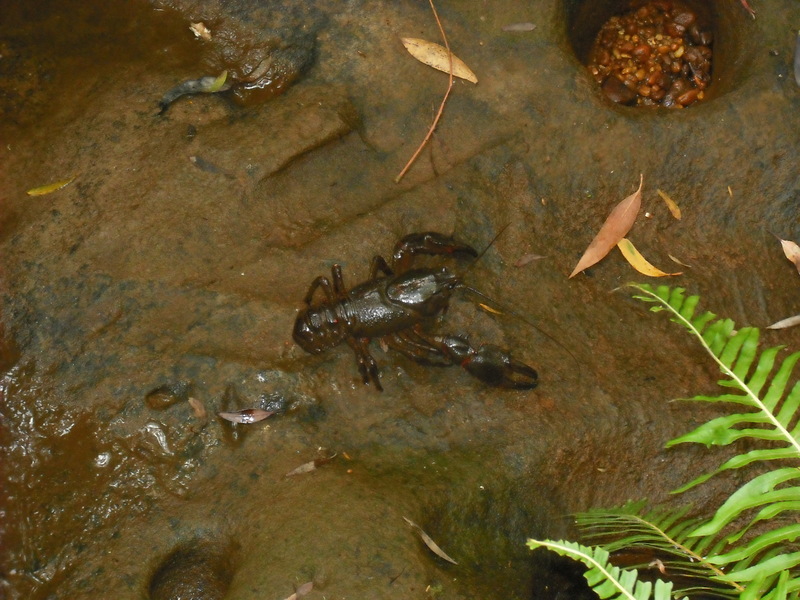 Water flow was reduced to a trickle and macroinvertebrate life forms (bugs) disappeared for several years. 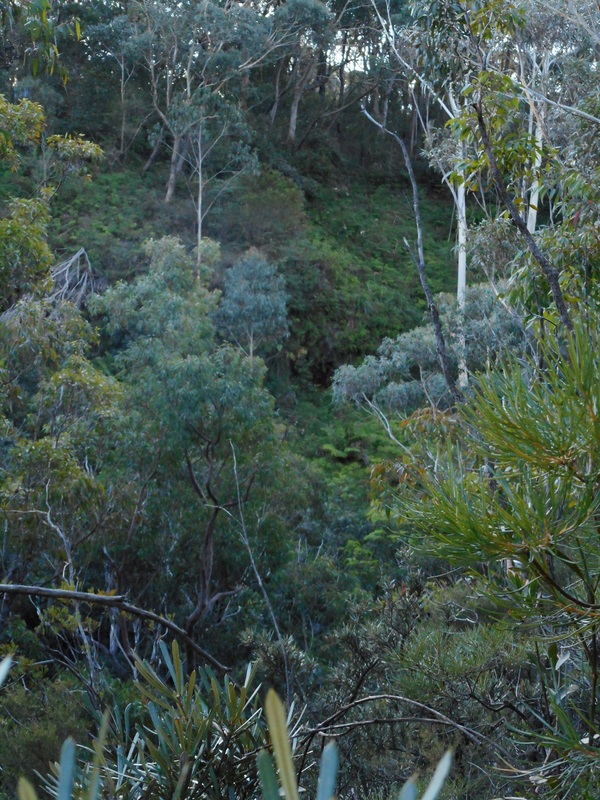 The bushcare group observed this situation and notified the BMCC bushland management team. 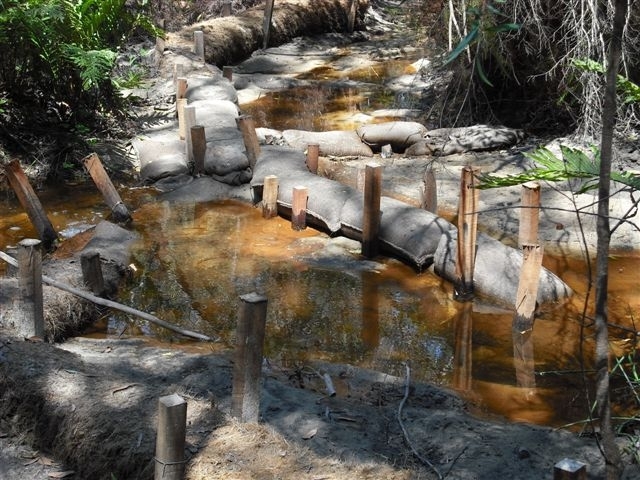 Contractors were employed to install a series of rehabilitative sediment control structures in the Creek, to control sand flows and to create pools of water for bug habitat improvement. 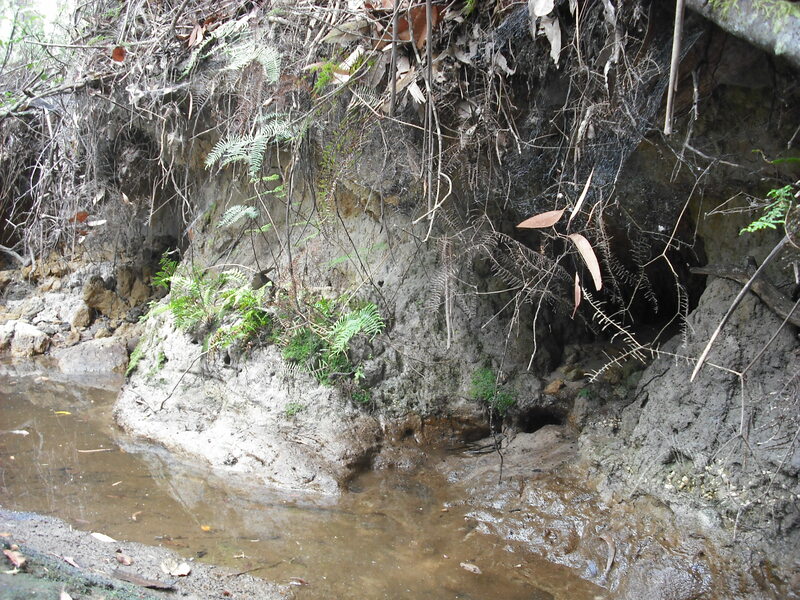 To some extent this massive flow of sediments was a natural event resulting from very heavy rainfall. 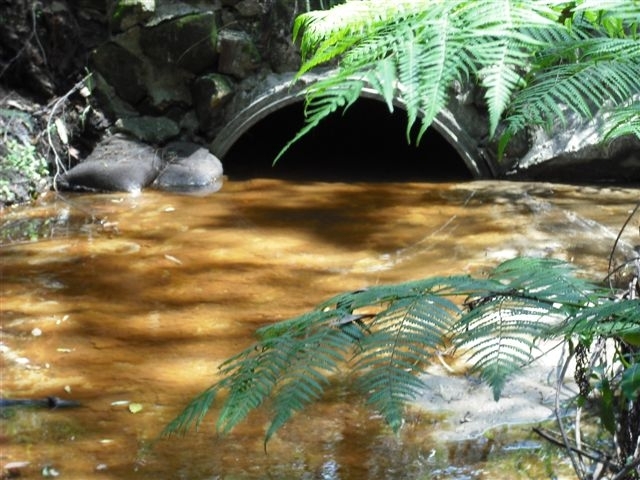 However, the concentration of stormwater flows into narrow pipes and gutters and other urban development factors such as the creation of hard surfaces and the removal of natural vegetation cover caused this dramatically increased flow to completely overwhelm the Creek. Due to its proximity to urban areas and influences, Lawson Creek requires constant monitoring for adverse impacts. Bushcare activities can provide this on-site monitoring role as well significantly helping to mitigate these negative influences by improving surrounding natural vegetation quality, in much the same way that Sydney Water uses natural vegetation to protect the sensitive Sydney water catchment. 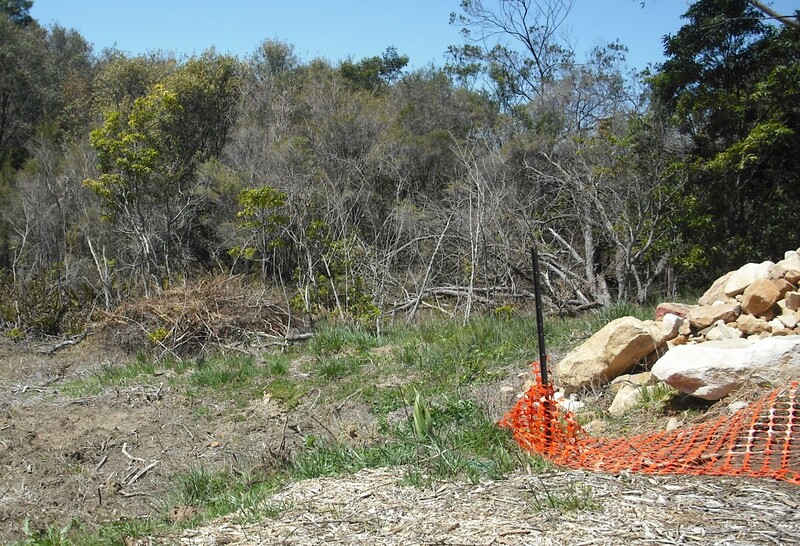 In 2016 BMCC bush regeneration contractors commenced swamp rehabilitation and stormwater control works at the eastern end of Ferris Lane, adjacent to the carpark. Large stands of Privet, a declared noxious weed, have been removed and a stormwater detention basin will be built, managing stormwater and weed seed flows into the upper reaches of Lawson swamp. 2018 has been a dry year, but some heavy showers in October sent a minor flood down the Creek, carrying away sand and creating a log jam of natural debris. This will become good bug habitat and a natural pool is already forming downstream of the log jam. Pictured below is the same site in October, 2010. 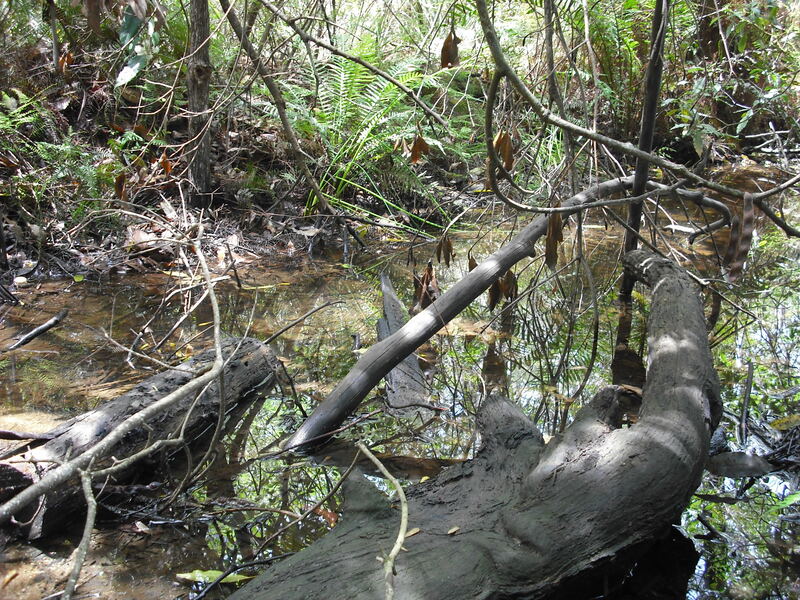 Creek banks and their adjoining riparian areas are very sensitive to any form of continual disturbance as the soils are often fine silt sediments that erode easily, especially if the natural vegetation cover is depleted and after heavy rains. The long-term impacts of unregulated disturbance, trampling, excessive and careless use can be devastating, resulting in vast areas becoming denuded of natural vegetation and eroded. Severe bank collapse may occur. Weeds thrive in these disturbed situations. 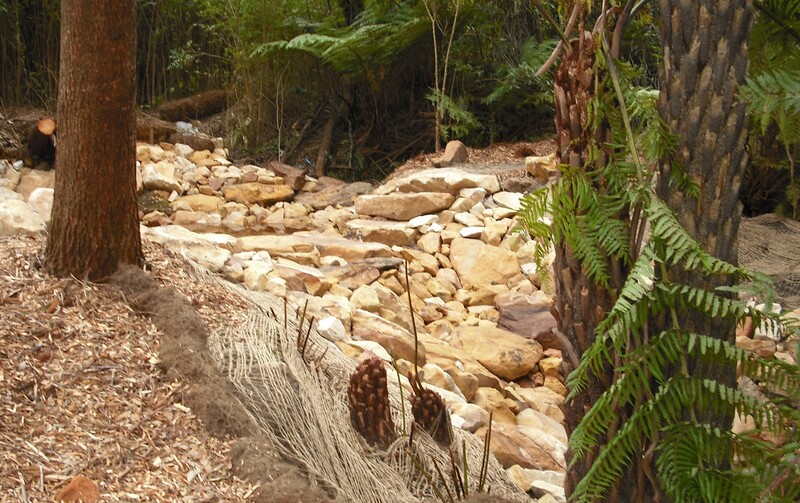 Excessive use resulted in a 100 square metres section of Lawson Creek bank and adjoining riparian vegetation, above Adelina Falls, becoming severely damaged over the period 2016-2017. Swamp vegetation many metres from the bank was trampled and the soil lost its natural cover. No swamps, no waterfalls! The BMCC Bush Regeneration Team remediated the damage by brushmatting the affected area, laying down layers of cut, natural vegetation to cover the bare areas and allow seed to scatter and germinate.